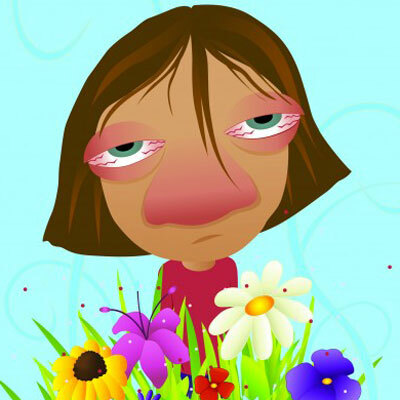 April showers + warming temperatures + early tree buds = increased suffering from spring allergies. If that happens to you or your family, begin now to prevent greater misery later. I know. It’s been a long, cold winter. As the weather warms, we all like to get outside and at least think about opening our windows. But if you’re bothered by tree pollen, think again. Opening your windows might help you sleep more comfortably at night, but spring winds can bring tree pollen right into your bedroom causing you to wake with the sniffles. And things might be getting worse. Botanists tell us that climate warming causes trees and other plants to pollenate earlier, in some areas up to two weeks earlier than just a few years ago. The nature’s spring pays little attention to our calendar. And this means that spring allergy season can last four months from March into June. In the Northeast, I begin mowing my lawn in April. Grass pollen is also a problem then, and that lasts all the way through the summer. Flowers and weeds contribute their own pollen to the mix. For folks who suffer from such allergens, gardening might not be the best outdoor activity. Don’t forget allergy triggers from winter either. Outdoors, spring winds can whip up molds and other debris that has lurked underneath the snow and in the soil. Molds and dust also accumulate in our homes during winter months. Spring cleaning is a worthy and helpful tradition! Pay special attention to bedrooms, floor coverings, and damp places in your living quarters. 1. Reduce direct exposure to tree, grass, and other pollens. If possible, keep windows closed and remain indoors especially at night. Use air conditioning to filter the air and change or clean filters monthly. Be especially careful on windy days, and keep an eye on your local pollen count (most weather apps provide this information). 2. If you are allergic to molds, take it easy while cleaning up outside. If you work outside or do gardening, wear a NIOSH-rated N95mask. Also avoid walking in the woods during wet weather or when pollen counts are high. a. Clean your sleeping areas thoroughly. b. Encase your mattress and pillows in allergen-proof covers (available online and in many bedding or department stores). c. Wash all bedding weekly in hot (at least 130ºF) water and dry on high heat. d. Replace wall-to-wall carpeting with non-fabric flooring. e. Remove as much upholstered furniture as possible. f. Vacuum with double-layered microfilter bag or HEPA filter installed. g. Use damp mop or rag to remove dust (dry rags merely stir up allergens). 7. If you take over-the-counter or prescription medications, it is wise to begin treatment a couple of weeks before your allergy season begins. Once symptoms have emerged, your body is primed to respond more readily to any allergy triggers. Managing spring allergies can be tricky. At Kathy’s Urgent Care, we can help. We’ll diagnose your situation, offer tips for controlling exposure to allergens, and prescribe the correct medications to help relieve your symptoms. Remember: No appointment is needed! Just walk in, 7 days a week, and we’ll help you feel better. Newer PostTime’s Up for Type 2 Diabetes!